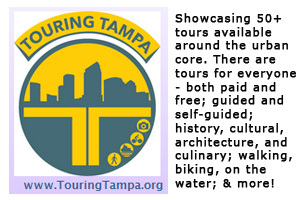 The United States Courthouse is the oldest significant building in Tampa originally designed for government use. The building was originally a post office and customs house, but was converted into a courthouse in 1984. Built in the classic Beaux-Arts style with stone and marble, the courthouse radiates formality, simplicity, order and tradition. The entrance is flanked by 3 story columns, is elevated from the street, divides two symmetrical wings, and sits at the top of sweeping stairs. The U.S. Government acquired the deed to the property from William B. Henderson on July 27, 1899. Built on a full city block the original design allowed for generous landscape areas. The construction drawings were completed by James Knox Taylor, Supervising Architect of the Treasury Department in 1902. The building is an example of the advanced type of construction developed by the Treasury Department near the turn of the century. Construction was completed in 1905. The original building was designed in a “U” shape with the rear open at the loading dock area. An addition was built at the rear (east) in 1931. The addition projects 27′ out at either side and completely enclosed the light court and occupies the remainder of the space within the property lines. 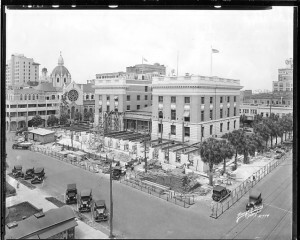 The building’s original purpose was as the main Post Office of Tampa, the postal presence in the building began to diminish in 1968. At that time the first floor postal work area was reconfigured for use by the Public Health Service and the Post Office was moved to the basement. The Public Health Service moved out in 1980 before the building was converted to its most recent use in 1984 by the U.S. Courts. The building has been unused since 1998 when the Federal Courts moved to a new building two blocks north on Florida Avenue. 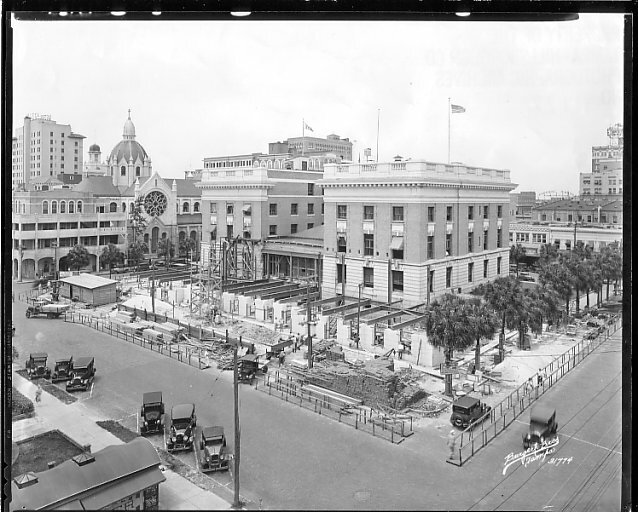 At that time they deeded the property to the City of Tampa which recently selected a developer to transform the Courthouse into boutique hotel.